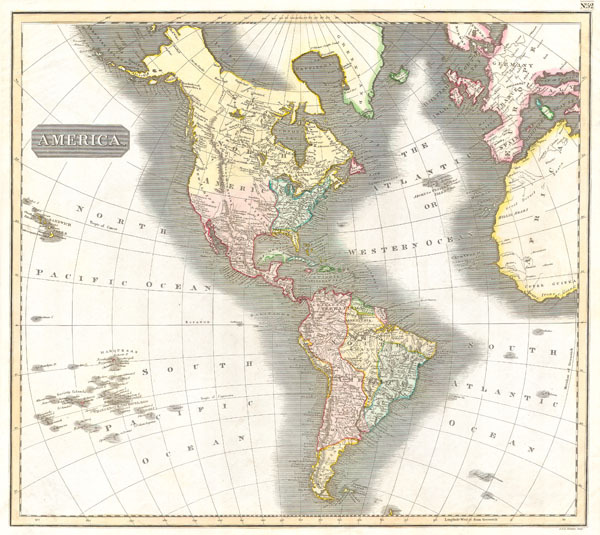 This fascinating hand colored 1815 map by Edinburgh cartographer John Thomson depicts North and South America, parts of the South Pacific, and the western parts of Europe and Africa. Shows the political borders as they existed at the time. Numerous geographical error in the mapping of the western ad Northern parts of North America are indicative of the largely unexplored state of the region. Includes the mythological Aurora island west of the Falklands. Greenland connects to the arctic wastes. Texas is not labeled but the Mission de los Teajas, from which the name is derived, is noted. Magnificent size, beautiful color, and high detail make this one of the finest maps of the Americas to appear in the early 19th century. Worthy of note: his particular map comes from the rare unfolded edition of the Thomson's atlas, and this does not suffer from a disfiguring centerfold or glue discolorations. If you are considering the purchase of a Thomson's America, this is the one you want. Fine or Perfect condition. Wide margins. Original platemark visible. Blank on verso.